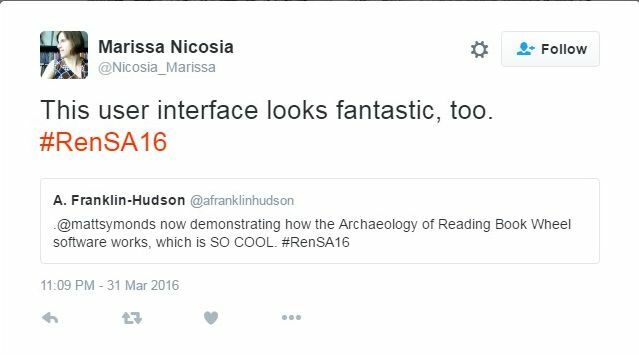 What is the Archaeology of Reading? It’s been a busy few weeks here at AOR as we look to finalize the content of our website, and it’s hard to believe that our London symposium took place over a month ago! It was encouraging to see so many old and new faces in Senate House for our symposium, and to hear the ways that working in AOR has helped scholars investigate so many different aspects of Harvey and Dee’s books. Our presenters offered everything from close readings of individual annotations and drawings to sweeping, data-driven analyses that looked at the ways that Harvey and Dee employed language in their books. We were also able to give a sneak peek of the nearly-released viewer, which the attendees could use to explore the books under discussion. The mix of projects and questions really drove home a concept that we’ve been seeing in Dee and Harvey’s books (as well as in our own working methods as we transcribed and encoded them) – that this type of inquiry, whether in the sixteenth century or the twenty first, is at its best when it is collaborative. The data provided by the transcriptions allowed some of our presenters to dive deeply into questions that would have only been able to be addressed in a very limited sense in any given book, such as the use patterns of individual words. It was rewarding to see how the traditional, context-heavy studies of annotation in books reinforced each other, and made for a productive discussion of just what these things that we call annotations (or marginalia) actually are, and what they have to do with reading as we understand it today, or how Harvey and Dee understood it in their own time. We’ve also been thinking about the ways that digital projects can and should change to keep up with their surroundings, and the fact that they’re never truly “done” in the sense of fixed, stable publications. As we concluded the symposium, Winston Tabb, Steve Ferguson, and Katie Birkwood led a panel on the development and management of digital projects like AOR in research libraries, and offered some insight on what “preservation” means in the digital age. We also took the opportunity to record the thoughts and impressions of many of the archaeologists who have worked on the project since its inception (and in some cases before), a small teaser of which is above. They’ll be uploaded soon, so please watch this space. As we continue to look back over the AOR website and update the content, we’re well aware that we’re working in a perpetual present, and we’re happy to have these little time capsules back into the project phase available for you to see. All in all, the symposium was a fitting milestone for the project, and a great sign of potential developments to come. After much transcribing, tinkering, and typing, we’re happy to unveil the fully-updated Archaeology of Reading viewer! We hope it provides a functional and sharp facelift to the Gabriel Harvey books, which are now joined by the 23 volumes annotated by John Dee. Now you can finally see what we’ve been blogging about for the past year and a half. Feel free to stop reading at this point, click on the red “Go to AOR Viewer” button above on the masthead, and dive in! While more detailed descriptions of how to use the viewer are available here, it might be good to call out a few particularly useful features. While all the books appear alphabetically by author in the gallery, the icons next to them will let you know who read which one. Dee (above) and Harvey (below) finally get the iconic status they deserve. Secondly, the tagged materials in each note now appear as live links, which can be used to initiate searches within and, in some cases, outside the viewer. Clicking on any one will give you the option to search for it within the book or the entire AOR corpus. Lastly, our viewer now features stable URIs for each image in the corpus, as well as some states of the viewer (such as searches). These can be pasted into a browser to immediately refer back to the page you were on, and can also be exported as a list by using the “Export Current Research” button in the top right of the header. You’ll be able to select the pages or searches you want to save and annotate them as a list of links in HTML, or, if you’re more graphically inclined, as a Distributed Scholarly Compound Object (DiSCO) in RMap. If the last part of that sentence didn’t make sense, don’t worry, but we hope that RMap will give the opportunity for searches, findings, and other observations to layer onto each other, and for researchers to see how this particular group of books is being read currently (meta-AOR). Save a particular set of references, or the meandering process that led to them, with our HTML export function. Our WordPress site has also undergone some modifications. Descriptive essays for all of the books in the corpus, as well as the larger libraries that they were drawn from are now available in the “Books and their Readers” tab. Click through them to learn more about the tale of two libraries this project now tells. A huge note of thanks is due to those of you who beta tested a version of this site over the holidays. We were able to do some last-minute adjustments to the search bar, in particular, to make the resource more easily navigable. The viewer wouldn’t look as nice as it does without the efforts of our resident technologists at the DRCC, and the creative eye of Cathy Shaefer and her team at SPLICE Design Group. We hope that you enjoy the viewer as much as our sixteenth-century readers would have. We’ll be adding more video and teaching content to the site over the upcoming weeks, so watch this space for more! 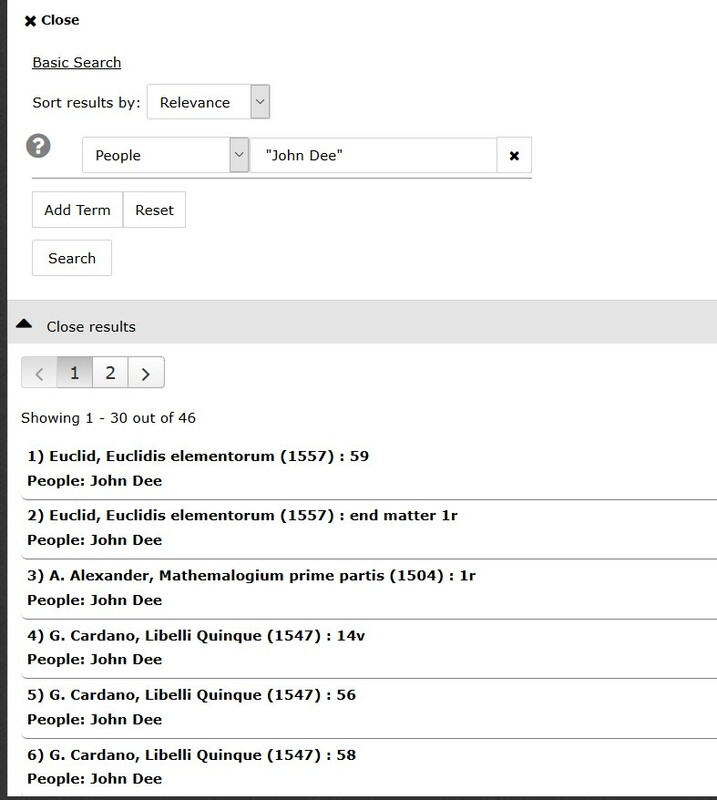 Since mentions of people in our individual annotations have been tagged, a quick search of AOR for “John Dee” (in quotation marks) in the person field of an annotation yielded 46 results across 16 of the 22 Dee books we have transcribed. This search required a little cleanup, as it captured annotations that included references to Dee or his books, or Dee’s ownership inscriptions on a title page. Eliminating those revealed 28 signed annotations across 9 different books. A few observations jump out from just the data. First, some texts appear to have been signed more heavily than others, with the Geoffrey of Monmouth signed the most extensively. Good to know that I noticed these notes after being beaten over the head with them (comparatively speaking) in the Monmouth. More specifically, these appear to be Dee’s way of editorializing and, in particular, problem-solving, as he does here, in explaining a correction to Maternus. Or here, questioning the lineage of Britain’s earliest inhabitants. Having just diagrammed out how Brutus could have been the great grandson of Aeneas on the previous pages, I’m unsure whether Dee is excited, skeptical, or exasperated to see a “nephew” appear out of the blue. Second, in the books with multiple signed annotations, the signed annotations appear to cluster together. Flyleaves and endpapers are consistent candidates, but within the body of the text, for example, we find a succession of signed notes in the Monmouth (fols 15-19) the Cardano (fols 56-63), along with two other signatures next to Dee’s work on tables. 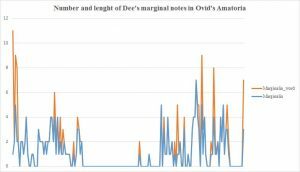 However, in the Cardano, some of these readings are dated, a trend observed in other books that Dee read around 1554-55 like the Mathemalogium, which records the date (and location) of Dee’s shared reading of the text in a Harvey-like note. By contrast, only one signed annotation in the Monmouth is dated, chronicling Dee’s discovery of a corrected manuscript that supports his (earlier) assumption about ancient place names, discussed in this earlier post. Some cautions here about the value of data alone – the clustering of signed annotations within any particular volume may be reflective of the overall clustering of annotations. Without broader context, we might not know how representative of a certain genre, time period, or topic this type of intervention is. It isn’t possible to locate all the books in Dee’s library catalogue, and even if we could (as I’ll leave for another post) we know that these aren’t the only books that he was able to put his hand on. Because such rich records survive, and because Dee was such a distinct annotator and intellectual figure, we know enough to locate books that aren’t mentioned in the catalogue that have Dee’s annotations. However, searching the entire corpus cast light on tendencies that I never would have encountered had I just been looking at Dee’s “historical” books (or indeed, just the Geoffrey of Monmouth). His dating of annotations, in particular, seems to have peaked at an earlier period than his notes in the Monmouth volume. It also allows us to observe Dee actively engaging in conversation with his books (clarifying material and posing questions) and, we must assume, the other readers that encountered them in his library. Even if these outputs don’t fit into neat or, for that matter, readily apparent categories, they allow us to ask questions that wouldn’t be askable of one book, or perhaps even one note in one book. Pulled together quickly, this zoomed out view of Dee’s reading helps test initial questions like “why would Dee ‘authorize’ his own notes?” and tie them to new discoveries in the field. This approach might also help scholars to identify practices to investigate beyond the corpus. On the same RSA panel, Jenny Rampling showed how far Dee’s notes might travel, tracing one out of the margins of an alchemical manuscript and into a printed book, via a fair copy made at the request of Dee’s traveling companion and “seer,” Edward Kelley (1555-97). If the notes in these books were Dee’s intellectual property, the Q&A session also revealed an early example of its theft: Nicholas Saunder, who made off with books from Dee’s library and tried to disguise their origin (as he has in the Pliny), appears to have written over Dee’s initials in the marginalia as well. Just as we “encounter” Dee in the margins of his books, so too did his contemporaries. What might their impressions been of him? At the most recent conference of the Renaissance Society of America (RSA) in New Orleans, I planned to speak about the difficulties in writing a more general history of historical reading practices and offer several possible solutions. More specifically, I wanted to explore various strategies which can be employed in order to examine similarities and differences in the reading practices of Gabriel Harvey and John Dee. Sadly, though, a winter storm prevented me from leaving Princeton and ultimately from giving my paper as I only arrived in New Orleans on Friday afternoon (hence missing out on most of the conference). 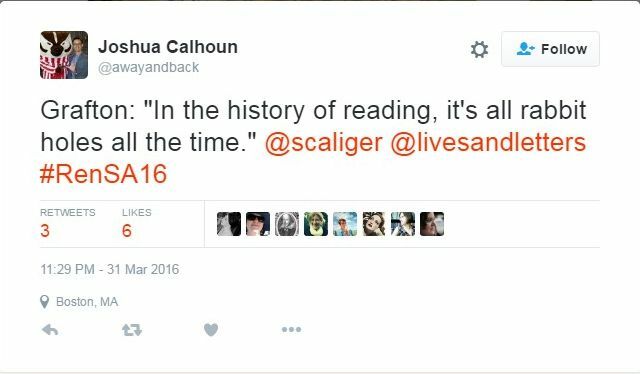 Although my paper was unlikely to revolutionize the field, some of the issues I address are relevant to those working on the history of reading. I therefore would like to make use this space to briefly discuss one particularly vexing problem, namely the difficulty of incorporating topical marginal notes in our analysis. According to Bill Sherman, a ‘topical note’ are those marginal notes which acted ‘as a concise key to the topic of a passage’ (Sherman, Dee, 81). 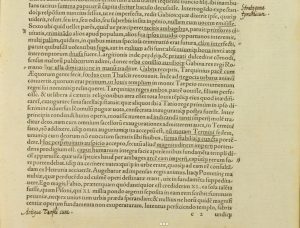 In general these notes consist of a just few words, often copied from the printed text, which indicate the main topic of a section. It is not that these topic notes completely escape the possibility of scholarly analysis: at their very core they show the particular intellectual interests of a reader. When having the advantage of working with a known reader, such as Dee and Harvey, knowledge of the historical context is of invaluable help when trying to make sense of such annotations. As Sherman remarked, ‘Dee’s notes in these passages [in some medieval books] are rarely interesting in themselves…but their value lies in the fact that he consistently drew attention to the material that would inform his own historical and political discourses’ (Sherman, Dee, 91). At the same time, even when equipped with (detailed) biographical information about a reader, the lack of interpretation on the part of the reader in turn renders topical notes difficult to interpret for scholars. Hence our inclination to focus on those marginal notes which are more verbose and informative in nature. However, such marginal notes represent only a small minority of the annotations that decorate the pages of most early modern books. Due to our focus on the relatively small number of interpretative notes, our research tends to be rather impressionistic in nature. But in general, topical notes abound: they litter the pages of the books owned by John Dee, while even a substantial number of annotations made by Gabriel Harvey, unusually verbose when annotating his books, are of the topical kind. Data-driven approaches can be used to show the proliferation of topical notes and might offer a solution to overcome, at least partly, their limitations. A particularly revealing case is Dee’s copy of Ovid’s Ars Amatoria (Paris, 1529). Dee only annotated this book sparsely: he scribbled 181 marginal notes in the margins while he underlined approximately 4000 words of the printed text. Moreover, the average length of these marginal notes was 1.3 words, meaning that the majority of these notes just consisted of one word. This is very little, even when compared to other books annotated by Dee and Harvey (bear in mind that the transcription work is ongoing and the figures in this overview are based on the statistics generated in late March 2018). Some books clearly stand out. 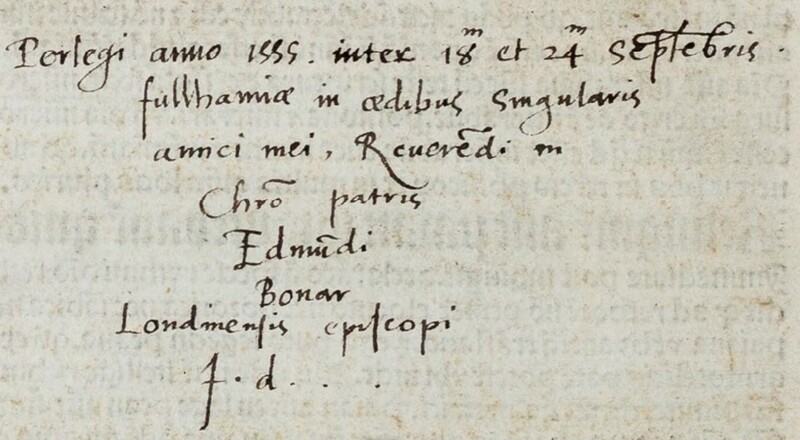 Dee’s copy of Euclid’s Elementorum, for example, only contained 25 annotations, but with an average length of almost 24 words (23.96). This average is greatly inflated by the appearance of a couple of lengthy marginal notes at the start of the book. 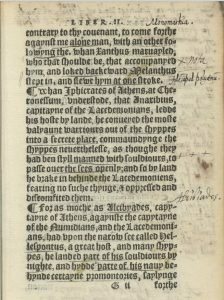 The numbers relating to Dee’s copy of the Pantheus’ Voarchadumia are skewed as well: Dee interleaved this book with blank pages onto which he copied the text another tract by Pantheus, the Ars Metallicae. Because these interventions are treated as marginal annotations, the average number of words is greatly inflated. 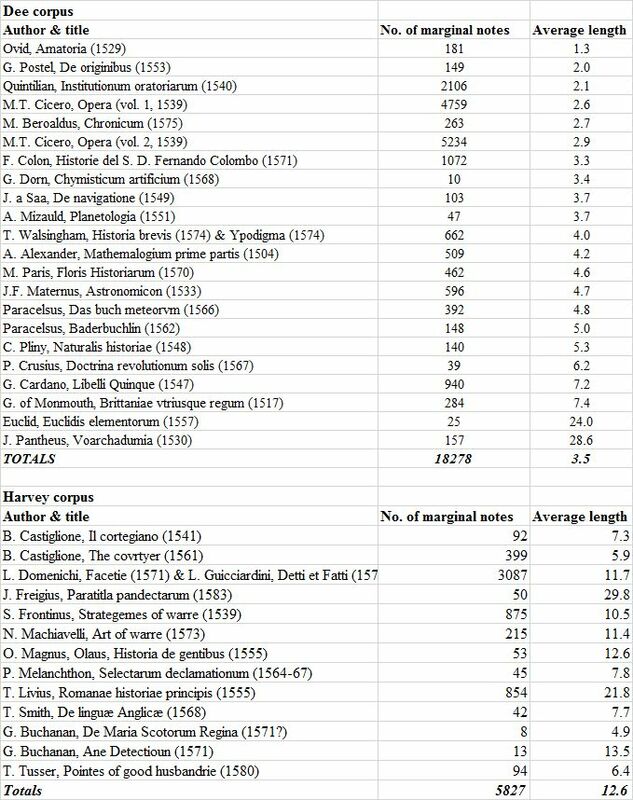 Harvey’s copy of Livy’s History of Rome, boasts a similar average (21.8 words), but based on an astonishing number of 854 annotations. Although massive annotations, such as one which consists of a staggering 718 words, helps to increase the average, the number of annotations which consists of one word are extremely limited: just 17 out of 854 annotations (almost 2%). (Topical notes in Livy’s Ab urbe condita, p. 27, and Frontinus’ Strategemes, Gii). In general, Harvey’s annotations were lengthier than those of Dee, as visible in the table above: Harvey’s average of 12.6 words against Dee’s average of 3.5 words. 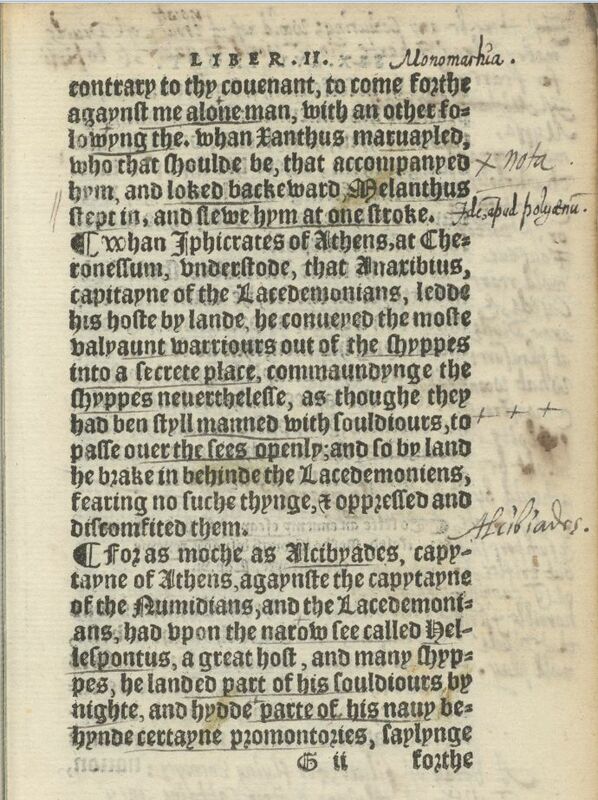 Let’s return to the example we started with, Dee’s annotations in Ovid’s Ars Amatoria, and have look at the content of these short marginal annotations. When creating a list of the words and the frequency with which they appear, the results are everything but surprising: number one on the list is the word *drumroll* amor (or its declensions), which is mentioned 31 times. In the vast majority of cases, the marginal note solely comprises the word ‘Amor’. What to do with these marginal notes? Close reading is one possibility: which passages did Dee mark with this word and, just as significantly, which passages were not indicated by Dee in this manner. Such an analysis can be expanded by including other books which contain marginal annotations with the word ‘amor’. 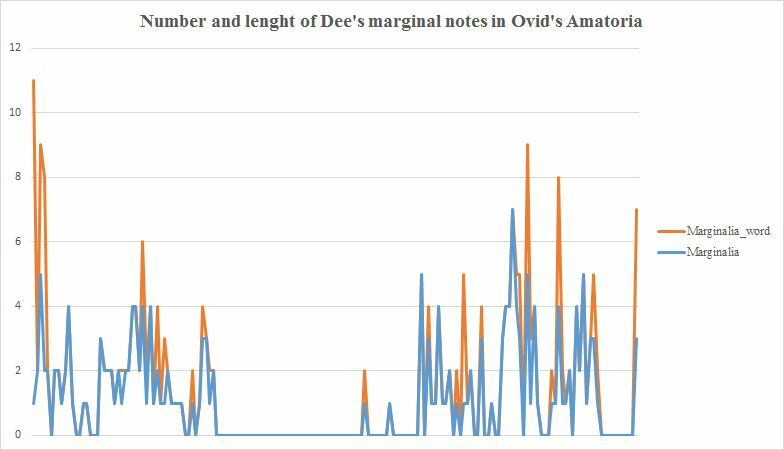 Such a ‘thematic’ search returns several hits for marginal notes in Cicero’s Opera and Quintilian’s Instititionum and can reveal a reader’s interest in a particular topic across his or her library. 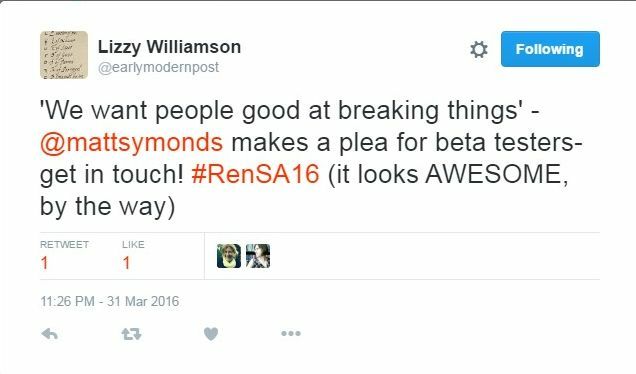 Another, data-driven approach, would be to employ statistical analysis. This is a strand of AOR that we started to develop near the end of the first phase of the project (2014-6) which focused on Gabriel Harvey. Our approach is based on the creation of concept groups, consisting of words which are related to a specific topic, including war, kingship, eloquence, books, action, etc, and which appeared with a certain frequency in Harvey’s marginal annotations. After that we, and by we I mean professional statisticians, calculated whether or not there existed statistically significant correlations between concept groups. That is to say, the extent to which words which are part of one particular concept group appear in conjunction with words that are part of another. In this way, we can discern whether particular topics of interests were related to one another. As such, we are primarily interested in the intellectual patterns that appear in the marginal notes, not in the numbers generated by the statistical analysis themselves. Although at present it is impossible to subject Dee’s annotations to such an analysis, simply because the transcription work is ongoing, we will be able to do so in a couple of months. By means of thematic searches and data-driven approaches such as statistical analysis, it might be possible to include some topical marginal notes into our scholarly investigations. Such data-driven approaches do not necessarily yield information about individual marginal notes: one-word notes, for example, cannot reveal a correlation between concept groups. However, topical notes are included in concept groups and hence figure in a larger thematic analysis. We might be even able to expand the current statistical analysis: what happens when we start to study the correlation between books, people, and concept groups? 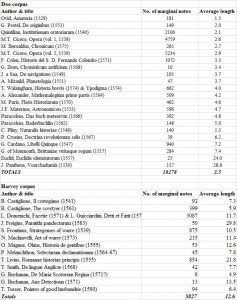 Another possibility is to check the names of the people mentioned in marginal notes against the index of a particular book. 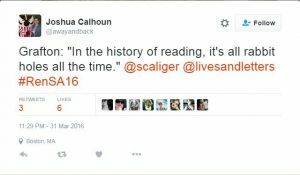 Which people were and were not singled out by our readers? I mention these possibilities in order to make clear that there are strategies for the inclusion of topical notes in our analysis. Invariably, such strategies are time-consuming and will require a lot of work from the scholar. However, they might enable us to include a larger number of marginalia in our analysis and to get a more rounded understanding of historical reading practices and strategies. 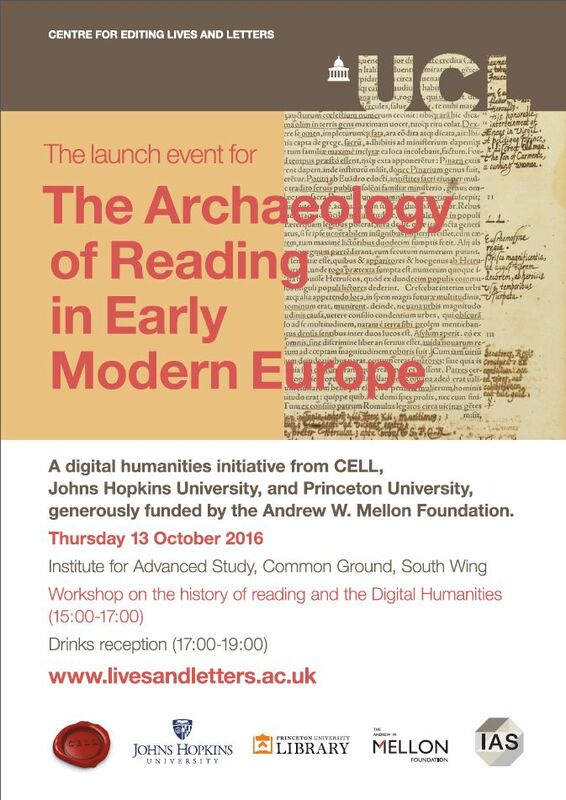 Last Thursday (13.10.2016) the UCL Common Ground provided the stage for our workshop in celebration of AOR going live earlier this autumn (see the previous blogpost). Posters and postcards had been circulating, and with clear results: the afternoon was very well attended. A panel of AOR-anciens gave four concise, evocative presentations, intermitted with Q&A sessions. Earle Havens started with a general introduction and spoke of the genesis of AOR, now shrouded in near-legend: the article by Lisa Jardine and Anthony Grafton, ‘Studied for Action: How Gabriel Harvey read his Livy’ (1990), and an inspired meeting between Earle and Anthony in a café in Louvain. The desire to study the history of early modern reading practices in a systematic way gave the project its spark of life. Three themes connected the presentations: the project’s clear-cut definition of ‘big data’ as ‘too much information’ that, as Matt Symonds explained, is beyond operating with data individually. Much like for Gabriel Harvey and his contemporary readers, the conditio sine qua non for AOR has been to create a framework to deal with such an information overload – to structure the data, as Jaap Geraerts put it in his presentation on the practical aspects of constructing a XML-framework. Second, the importance of cross-sectional collaboration. As a scholarly resource, it is vital for AOR to build that framework not as ‘words on a page’ but as a mobile, flexible creature that brings together conservational, technological, and intellectual imperatives. AOR exists by the grace of the symbiosis of its bibliographical, technological, and scholarly expertise. And third, the way in which AOR broadens the research horizon. As became apparent during the Q&A sessions, a resource like this makes new research questions possible: to compare Harvey’s marginalia with Harvey’s own books, for example. Or, as Arnoud Visser from the University of Utrecht suggested in his presentation in which he approached AOR from the viewpoint of an end-user, to start reading between the lines of marginalia and look at what is omitted, not talked about, or implicitly alluded to. Other interesting questions arose during the Q&A, for example asking about the curatorial aspects of assembling the corpus. When we say workshop, it was only the first leg of the afternoon. The panel discussion was followed by a reception in the Common Ground, during which both the Leffe and the inspiration flowed lavishly. If you want to (re)visit the workshop: a video will be made available in the near future. Launching the viewer: RSA 2016 & Open Beta! Ever since the start of AOR in September 2014, RSA 2016 in Boston had been firmly in the back of our minds and highlighted in our agendas (our PI Earle Havens made it a habit to remind us about this deadline wherever and whenever he could), as this was the time and place where we would launch our viewer and present it to the wider academic community. This was the moment at which more than one and a half years of blood, sweat, and tears had to come to fruition, and in the preceding months the whole team worked hard in order to get the viewer RSA-ready. The organizers had scheduled our session at the last session (17:30-19:00) on Thursday, March 31, the first day of the conference. AOR was thus the exciting end to a wonderful CELL day, as all the CELL-sponsored panels were planned on this day, starting at 8:30 in the morning and continuing right through the end (some of them annoyingly coinciding with the amazing panels on annotated books organized by Earle, a recurring problem at RSA). All the CELL panels were chaired by our own Matt Symonds, a truly heroic effort for which he deserves great praise! The CELL panels included a wide and stimulating variety of topics, ranging from new research on the early years of the Bodleian Library, stairs in houses in early modern London, to seeing early modern books as “pestilential clouds.” One panel was devoted to honoring Lisa Jardine and consisted of moving talks by her friends, colleagues, and students (although these distinctions tended to blur for those who were part of Lisa’s familia). Important fact: there were amazing doughnuts as well (in true Lisa style, for whom providing good and plentiful food at academic gatherings of any kind was a matter of personal pride)! Then, finally, after already quite a long day, the AOR roundtable was to commence. Earle Havens kicked off with an introduction of the project and its relations to the wider historiography of the history of reading. After that, Chris Geekie spoke about some intricacies of Harvey’s annotations and ways in which he dealt with those. Thereafter, it was time for the moment suprême: the launch of our viewer. Matt focused on the image and transcription viewing, showing the bookwheel capacity of our viewer: its ability to open up to 25 (!) workspaces (i.e., the space in the screen where an image and a transcription panel can be opened) next to each other, making possible quick leaps within a book or from one to another book. I took over by showing and explaining the search functionalities of our viewer, which consist of a basic (string) search and an advanced search that allows users to build complex queries. The advanced search, which is still under development, gives users the possibility to drill deep into the data and discern patterns that are difficult to discover in a traditional analog environment. 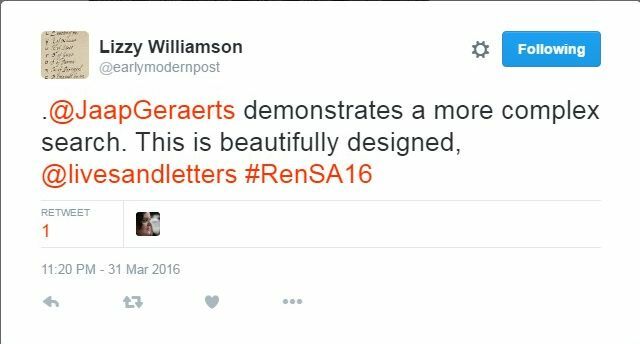 And luckily, we got some positive feedback! Moreover, every single search result is a clickable link, with the user having the opportunity to open the search result in the current or a new workspace, further opening the possibilities to go down the rabbit hole, an expression that seems particularly suited to capturing the possibilities of doing research within the AOR viewer. After Matt had given a demonstration of a particular search scenario based on his own research, Tony introduced the Winthrop Project to the audience. This project aims to study the library and archive of the Winthrops, an English family that emigrated to New England in the 1630s. This project is closely linked to AOR, but not only because of the shared interest in the history of reading; for the Winthrop library includes various books that were first owned and annotated by John Dee and later by several generations of the Winthrop family, and that will form part of the AOR Phase II corpus. We are very much looking forward to working together and sharing ideas (and technology!) in the coming years. The AOR viewer is open for Beta testing!! You can find our website at www.bookwheel.org and or viewer by clicking on the bookwheel image at the start page or by directly going to www.bookwheel.org/demo. Please have a go at it and let us know what you think (email earle.havens@jhu.edu or m.symonds@ucl.ac.uk). In the last blog of 2015 I’ll give a short update on the conferences several of our “archaeologists” recently attended. Reflecting the various strands of the project, the AOR team consists of scholars, computer engineers, and librarians, and as a result a wide variety of conferences are part of our dissemination activities. Last week, on Tuesday December 8, Matt and I went to Ghent to attend a IIIF workshop. 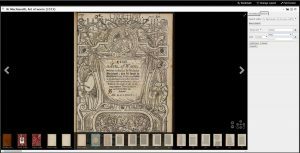 IIIF stands for International Image Interoperability Framework, and can be described as an initiative to open up and make accessible the digital image collections hosted at various institutions such as libraries and archives. 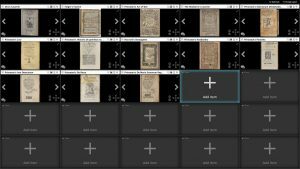 Whereas most collections are accessible only through their own purposely built viewers, IIIF-complaint viewers are interoperable and can access all collections that are hosted on image servers that support the IIIF presentation and image APIs. The main advantage for scholars is that they won’t have to use and learn to work with different viewers, but instead can use one viewer to access collections scattered across different institutions, enabling exciting comparative research. Institutions, on the other hand, no longer need to invest in creating and maintaining several viewers. Although we did not present at this workshop, Matt and I attended it because AOR uses a IIIF-complaint viewer called Mirador. 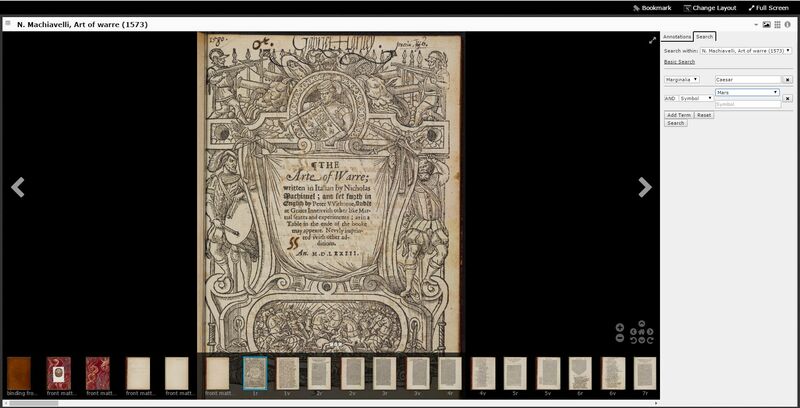 We wanted to enhance our understanding of IIIF and to familiarize ourselves with the various projects that make use of IIIF and are currently rolled out in libraries and other institutions hosting image collections. From the perspective of AOR it is particularly interesting to see the ongoing development of IIIF itself: because its APIs are developed for displaying images and providing some related metadata, the functionalities of most IIIF-complaint viewers generally do not move beyond the viewing and browsing of images. The ability to search the digital transcriptions that are displayed next to the corresponding image is of great importance for AOR, and several use cases comprising search have been developed. 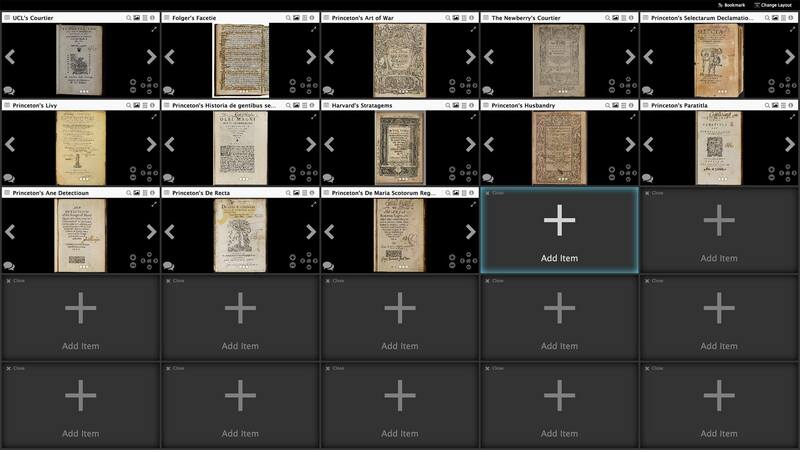 Although a IIIF search API currently is in development (to be launched around May 2016), we, and by “we” I actually mean our tech wizards Mark and John, are already working on adding some search functionalities to our viewer. In this way, AOR can contribute to the development of IIIF. A week later, I flew to Washington D.C. to give a presentation with Sayeed Choudhury, Associate Dean for Research Data Management at Johns Hopkins, at the fall meeting of the Coalition for Networked Information (CNI). Interestingly, there were various presentations on IIIF, as well as on projects that relate to data management and preservation within universities, archives, and libraries. In our talk, Sayeed and I focused on the developmental process and workflow of AOR rather than on its outcomes to date. We emphasized the fact that, from the very outset of the project, computer engineers and scholars have been closely working together in creating the project’s infrastructure. This close cooperation is visible in the development of the schema (see my previous posts) and the uses cases, for example, but also in the ongoing discussions about the AOR data model. As Matt has succinctly phrased it: AOR does not rely on a “client-provider” model, where at some point in the project humanists simply ask the techies to build X or Y (which can have disastrous results if at the designing stage critical things have been overlooked). Instead, the development of the AOR infrastructure has been iterative and has evolved out of a continuing dialogue, a deep engagement between scholars and computer engineers, making optimal use of the particular skills and expertise of all team members. This approach, we believe, is one of the strengths of the project, and we shall continue to benefit from it in the future! This was all for now and, for that matter, for 2015. I’d like to end by wishing all the readers of our blogs happy holidays and a wonderful 2016! See you next year! Albeit with a heavy heart, due to the loss of Lisa, our director, dear friend, mentor, and source of inspiration, we’ve continuously worked on AOR. We feel it’s important to try to carry on Lisa’s legacy, which can be done partly by making AOR, a project she was so excited about and that got off the ground largely because of her vision and enthusiasm, a great success. One of the things we’ve done is to update our website, where you now can find a download page. This page contains documentation, such as the Transcriber’s Manual, but also our very first data release, which consists of all the raw data of the project, including the XML transcriptions, the lists of people, books, and geographical locations mentioned by Harvey in his marginal notes, and accompanying documentation. Please do get back to us with any remarks, questions, and suggestions about our data! 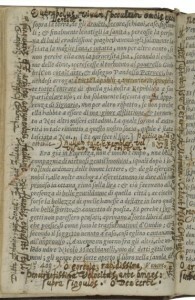 For the remainder of this blog, though, I’d like to go back to the topic addressed in the previous blog: namely, how to link marginalia that run across different pages. As mentioned, this practice is particularly challenging for our schema, as it deliberately captures all marginal notes on one page. As a result, both parts of one marginal note are tagged as two separate marginal notes in two separate XML files. In what follows I will explain the way in which we join them together. Folgers, Domenichi, f. 16v-f. 17r. The connection between the two parts of the marginal note is established via two unique IDs which are attributed to both parts. We then use an attribute to refer to the unique ID of the other part. However, we also need to establish the “direction” of a specific part: i.e., is this part the continuation of an earlier part or is it the start of the marginal note? The viewer needs to know this in order to be able to decide whether, in the digital transcription the user will be seeing, the text of a particular part needs to be put in front of or after the text of the other part to which it is linked. Admittedly, the names of some attributes are a bit clunky, yet this nevertheless is quite a straightforward solution, even though transcribers have to be careful not to mix up the IDs and the “direction” of the marginal notes (read this as a note to myself, as I’ll be modifying the relevant XML files). For me, this was a particularly interesting challenge to deal with, especially because it again brought together the scholarly and technical strands of this project as it involved discussions with Matt here at the CELL HQ and with Mark and John, the “techies” at DRCC. As a result, this solution is very much the outcome of an incremental process, resembling the development of the XML schema as a whole. The issue of linking marginalia, as it touches upon various aspects of this project, again highlights why DH projects, and AOR in particular, are so fascinating. 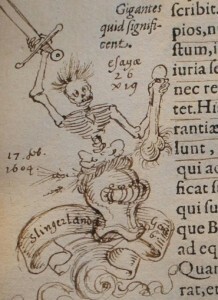 On Friday morning, May 1, Matt and I traveled from London to Cambridge to attend the Early Modern Visual Marginalia workshop, organized by Alexander Marr and Kate Isard. 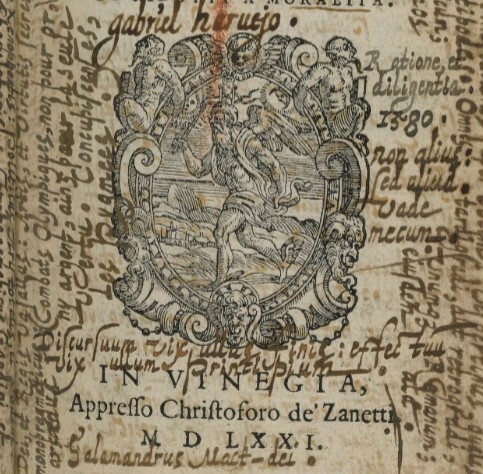 This workshop focused on a specific type of marginalia, namely drawings or other forms of visual annotations that early modern readers drew in (or sometimes literally cut and pasted into!) the marginal spaces of their books. 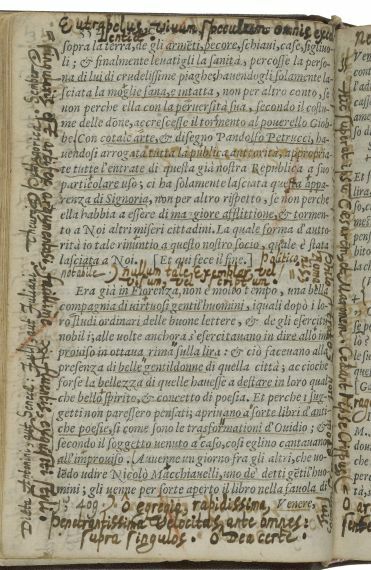 Whereas the study of marginalia is extremely fashionable at the moment, most of these studies focus on the more conventional textual marginalia (i.e., written notes), while the visual interventions in early modern books still are understudied. This could very well have been the result of disciplinary boundaries, as the first speaker, Julian Luxford, remarked, as medievalists have been paying close attention to the visual marginalia that appear in medieval manuscripts. 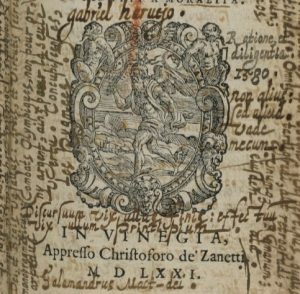 Even though visual marginalia are rarer than their textual counterparts, their appearance in early modern printed books warrants careful study. The morning session of the workshop consisted of several papers all of which dealt with particular aspects of visual marginalia and the sources in which they appear. It soon became apparent how complex these visual marginalia are, as they often involve a combination of text and image, and what a large variety of visual interventions were used by readers, ranging from emblems and architectural drawings to full-fledged mathematical diagrams. Often, like their textual counterparts, visual marginalia refer to objects outside the book in which they were written down or drawn. Whereas Harvey, for example, frequently refers to other books, visual marginalia could refer to a host of material objects that existed outside of the book, including (no longer existing) buildings. After lunch, we continued with a special session in the Cambridge University Library, where Ed Potten, Head of Rare Books, made available a number of early modern books that included visual marginalia (a number of which were selected by the organizers and several participants of the workshop). 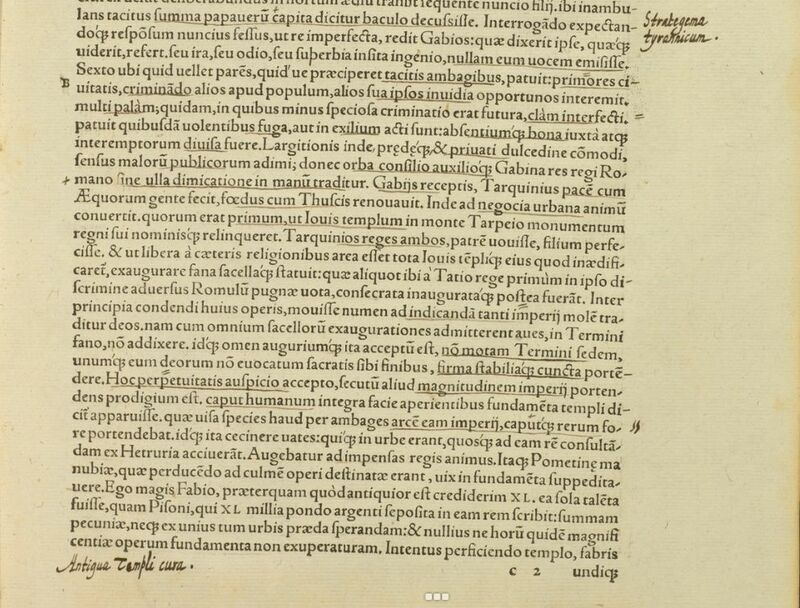 All these examples of visual marginalia, especially those in an annotated copy of Johannes de Sacrobosco’s Tractatus de Sphaera, made us realize how complex this form of annotation is and how tricky this is going to be to capture in XML. 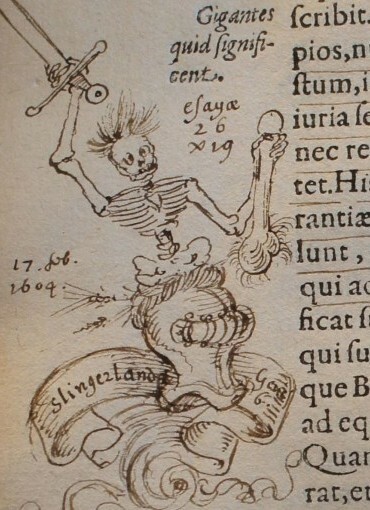 Currently our schema is poised to deal with the relatively easy drawings made by Gabriel Harvey, who hardly made use of this form of annotation (see the image below for a rare example). We need to think hard about how to incorporate the more complex visual marginalia in our schema as well, especially as we are going to work on John Dee in the next phase of the project. Thomas Hoby (transl. ), ‘The Courtier…’ (London, 1561). All in all, this was a very fruitful day, with some thoughtful papers in the morning and the opportunity to browse wonderfully annotated books in the afternoon. Hitherto visual marginalia are a rather neglected form of annotation that deserves much more attention, and hopefully more workshops like these can and will be organized in the future. In the meantime, we will continue to work on refining our XML schema in order to be able to capture more complicated drawings, so stay put for more updates on this topic! Last but not least: massive thanks to the organizers of this wonderful day! 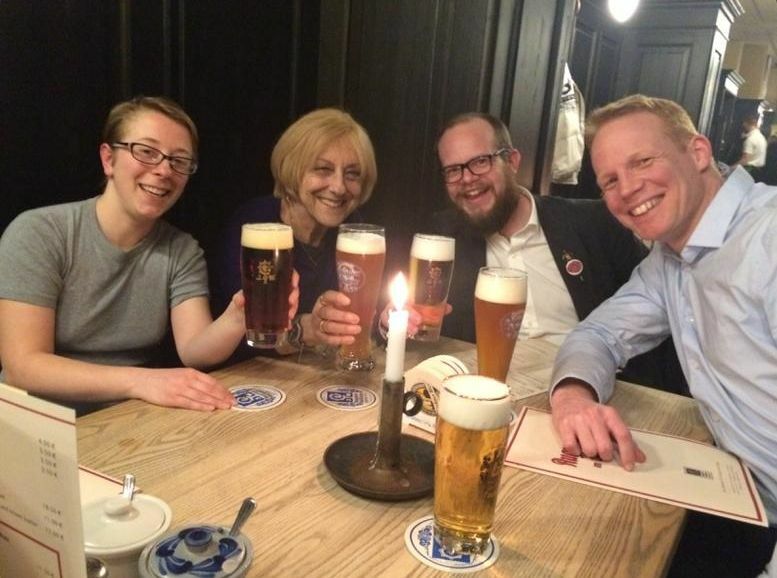 Last week was the 2015 edition of the Renaissance Society of America (RSA) conference, held at the Humboldt University of Berlin (26–28 March). It’s one of these American mega conferences, the size of which can be quite overwhelming, and CELL unanimously decided that easing into it was best done by eating some traditional German food in combination with an appropriately sized glass of beer. The AOR team was well represented at the conference: Earle Havens and the Charles Singleton Center for the Study of Pre-Modern Europe had organized countless panels, including a couple of really exciting ones on late medieval and early modern marginalia. CELL, for the first time being an associate organization of the RSA, had organized two panels, both of which were scheduled for Saturday morning (unfortunately clashing with some of Earle’s panels, something that is unavoidable at conferences of this size). The CELL panels consisted of strong papers on a large number of topics, including Quakers and publishing, language learning and early modern travel, and legal records and life writing, to name but a few. Directly after this panel it was time for the Roundtable, which consisted of our Principal Investigator (PI), Earle Havens, and the two co-PI’s, Lisa Jardine and Tony Grafton, and was chaired by Bill Sherman. Lisa and Tony explained the context of their groundbreaking article “Studied for Action” and reflected on the historiographical developments that took place after its publication, while Earle related AOR to this article and to the current state of this field of research, further stressing that we have moved towards the study of reading practices rather than examining marginalia in order to learn more about the life of the annotator. Matt then showed the audience a first glimpse of the AOR website and the prototype viewer, after which the floor was opened for questions. It’s safe to say that RSA 2015 has been a great success for AOR. We think that we’ve generated a lot of interest in and awareness of our project, and it was great to exchange ideas with other scholars who are working on similar topics. 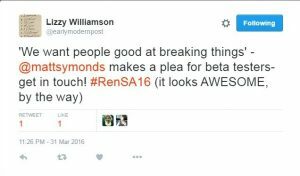 Moreover, it was a pleasure to see so many colleagues and friends, and we’re already looking forward to RSA 2016. See you in Boston! What is the Archaeology of Reading (AOR)?